Inside the box : pork slices with pineapple sauce, cherry tomato, carrots & cucumbers, oranges, and egg flowers. Extra pineapple sauce were in the green bird sauce cup. I love your growing crops idea, it's so cute! I hope you get another long rest tonight, although your spontaneous work is still so artistic. You can make a lovely bento without any prep at all! So nice! OMG Lia, This is adorable. The sliced pork and oranges are arranged in such a way that they look like crops in the fields just like in a painting! Genius! Glad to hear that you feel a little better. what a cute farmer couple! please decorate my lunch box. reminds me of ponyo (a character from jap. animation cartoon). glad u are feeling better. Sorry to hear you aren't feeling well and am happy you got a nice sleep. I love gardening and this is a great bento! @javapot : Since you mention it, I browsed around about Ponyo hehehe ... the character is so cute, worth to try it on the bento sometimes. Thanks Javapot! The pork looks really delicious ;) And the way you decorated with thin egg sheets is adorable! @Rachel Hei : Thanks a lot Rachel! We love the cute things, don't we? Kids Dream Work : Oh no! I am not that genius. I just lucky sometimes, like this morning ;o) Thanks a lot for your nice comment, really appreciate it! Mbak Liaaaa... You're back! 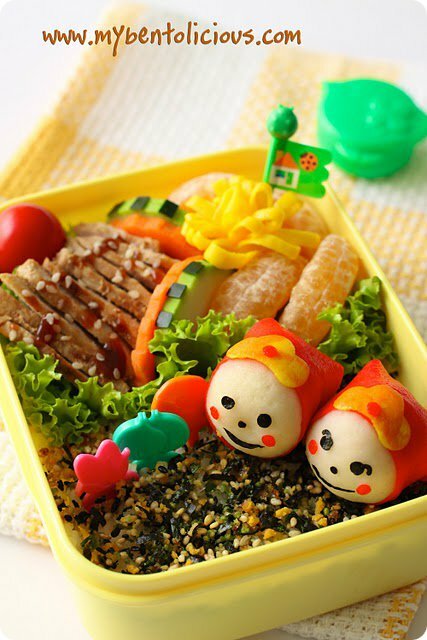 Miss your adorable bentos so much :D. This bento directly reminds me to cute chubby Shinzo Hattori (Kanzo Hattori/Ninja Hattori's younger brother) who wears red colored Ninja robes *oh, now I miss to watch Ninja Hattori hehehe*. So glad to know you're feeling better by now. I think you got that terrible sore throat and headache since you cleaned up my dusty blog too hard wkwkwkwkwkwk LOL! Haha, I even still remember well it's OST --> Mendaki gunung lewati lembah, sungai mengalir indah ke samudra, bersama teman bertualang... dan seterusnya hehe. That's my favorite bathroom-time song LOL! What a cute farmer and wife! You are so creative! I can't believe it was spontaneous it looks so well planned! Lia, this one is so so cute! My favorite is the furikake soil, haha. Lia that is so cute!!! You are always so artistic and I can't belive that you are sick and still managed to put this beautiful bento together! Hope you are feeling well soon! Cute farmers! Love the colors of the bento too. Super cute bento! Love the farmer and his wife. Hope you feel better soon Lia! I really admire your creativity to come up with anything.